Kauker Manor is a Stage 8 High-Wealth Residential Building that grows on only High Density Residential zones. 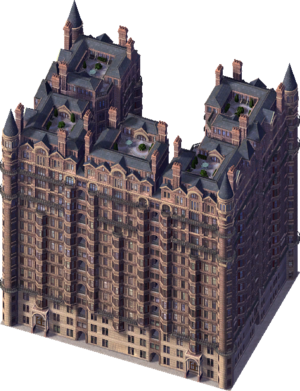 Kauker Manor appears to be based on the former Navarro Flats complex on Central Park South, New York City. Construction on the first buildings in the complex was completed in early 1884, though it is not known when the complex as a whole was completed. The site was sold off in parts and demolished in the late 1920s and the New York Athletic Club, JW Marriott Essex House and Hampshire House were built on the site. None of the building remains today. When the Colossus Addon Mod is installed, all of the default lots for this building become Stage 9. It is otherwise unchanged. This is one of the highest stage buildings in the Chicago Tileset, sitting at Stage 8, the highest stage the game has without the CAM. ↑ When Spain Reigned on Central Park South New York Times, 2007. Retrieved on 14/05/2014. This page was last modified on 8 June 2014, at 13:58.